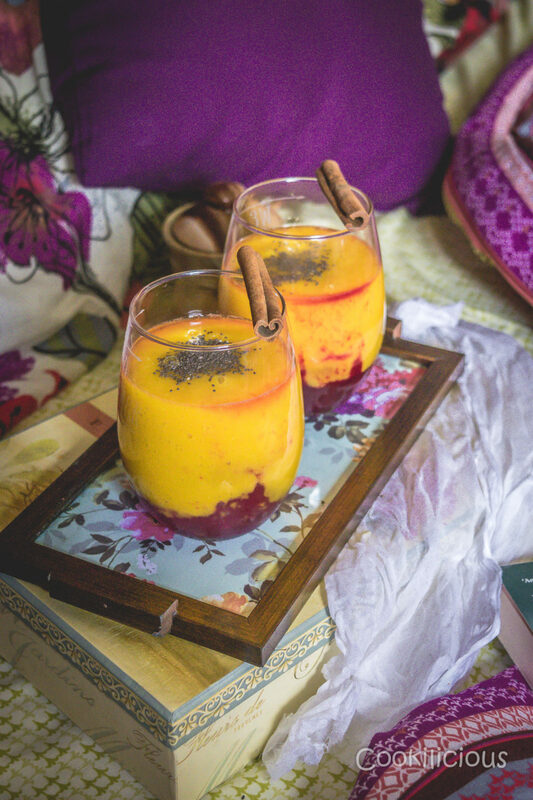 Enjoy this delicious freshly prepared mango orange summer drink prepared with beets today. 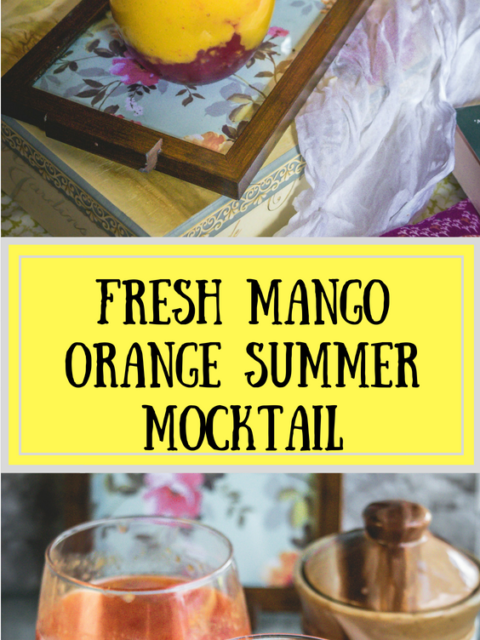 It’s a simple, dairy free, non alcoholic mocktail that’s loved by all. Its sweet & tart! Mangoes and Oranges are my favorite fruits! It’s a real coincidence that I hail from Florida which happens to be the sunshine state! Our symbol is oranges, so it goes without saying that we get all kinds of oranges in abundance all year through. Mangoes in fact, remind me of Bombay. Maharashtra (one large state of India) boasts of producing the sweetest mango ever – Alphonso. It is also one of the most expensive fruit and maybe that’s why its known as the king of fruits. Both these fruits are naturally sweet and generally high in fiber, vitamin C, and water. Regular consumption of these fruits is very beneficial and considered to be a nutritional powerhouse. 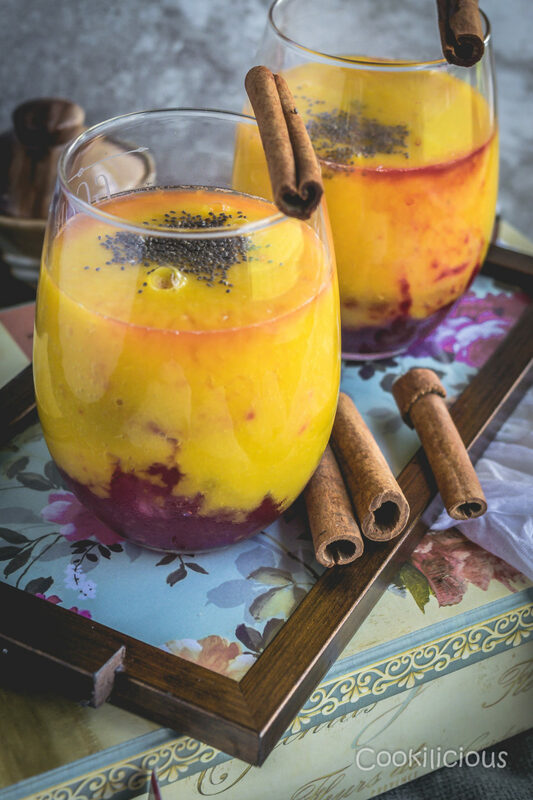 So just the idea of combining mangoes and oranges in a recipe will uplift your mood and immediately refresh you even before tasting it. I am largely into juicing as I dislike eating fruits. I know..I know..that is weird, considering I work with food all the time! But its true, I don’t like to eat fruits. So the best way for me to get the nutrients from them is through juicing. I avoid straining the juice unless very necessary and make it a point to at least consume one fruit a day this way. Hopefully, eventually I may start eating fruit salads as well some day. Well, that is the hope! 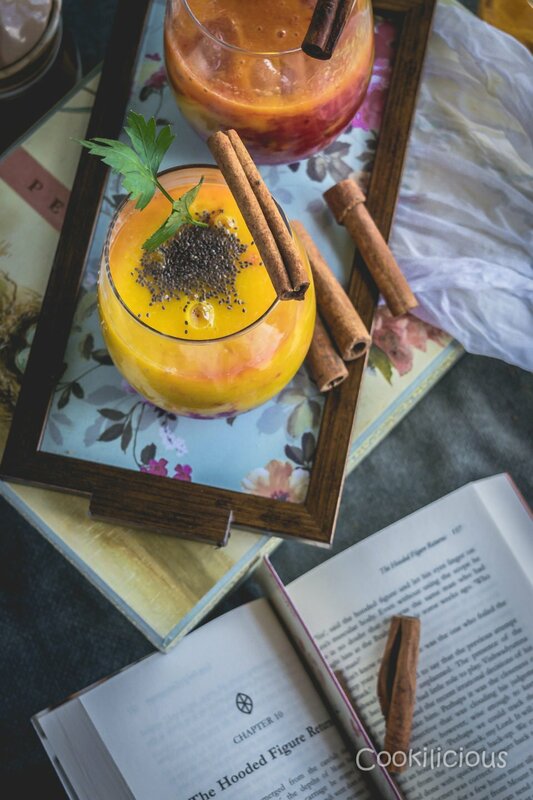 🙂 But before we get on to this particular mango orange recipe, I would like to share a small memory from my childhood where mangoes play a significant part. One of our neighbor owned an agricultural land in their hometown and since we were more like family than just neighbors, we were privileged to many perks. Most of the perks revolved around FOOD! They were Maharashtrians and we were Tamilians. There was constant exchange of food everyday between the houses and both eventually got fond of each other’s cuisines. But there was something else which my brother and I always looked forward to. It was the harvest season of mangoes which always coincided with our summer holidays. We would wait for that big brown cart to arrive at our doorstep and then impatiently nag our parents to open it up and give us MANGOES! They were the sweetest Alphonso mangoes we had ever had and we were allowed to have 2 everyday till it was all gone. But then, the empty cart would soon be replaced with a full one (God bless my neighbors) and history would repeat. I do not remember ever buying mangoes from a store as it was not needed and this happened for nearly 16 summers of my life! Clearly, mangoes have a special place in my heart and it upsets me to no end knowing that I cannot get Alphonso mangoes here in the US for whatever reasons. I have to make do with the ones available here. But it’s OK, I guess. However, even today my eyes light up when I see mangoes at any grocery store and fondly remember those sunny days of Bombay where my brother and I would unabashedly relish a full mango in all its sticky mess! together. Blitz. Strain this if you like a clear juice. Else leave it as is. Wash the blender and add cooked and grated beets along with honey and blitz again to a smooth puree. To serve, first add a couple of spoonfuls of freshly prepared beet juice in the serving glass and then pour the mango orange juice in it. Add ice cubes if required and serve chilled. 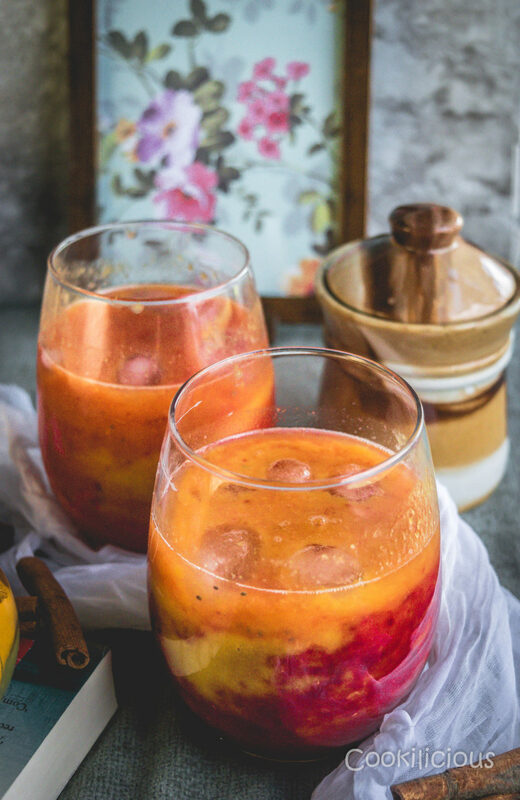 Enjoy this homemade smoothie/juice as part of your breakfast regime along with some Mug Cake or Mini Veggie Fritters or even Rawa Paniyaram in Appe Pan. This is my non alcoholic version of a tropical Margarita and that too so early in the morning! 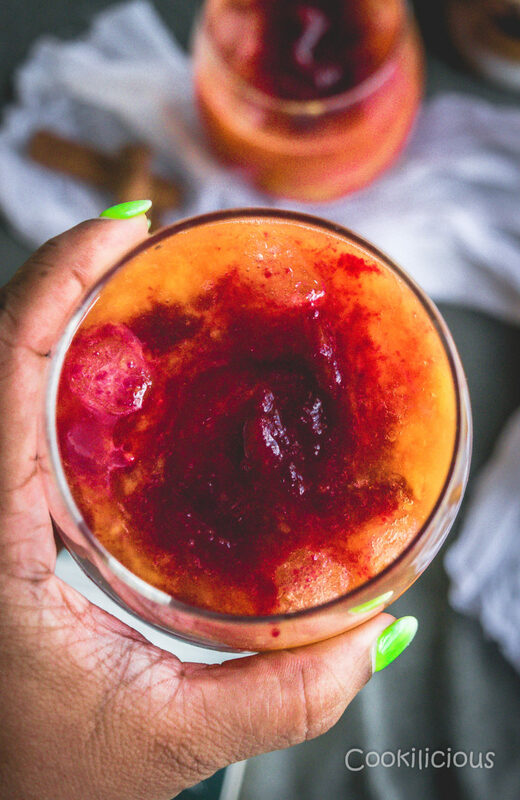 This drink is bubbling with flavors and its got a sweet and tangy taste that lingers on. 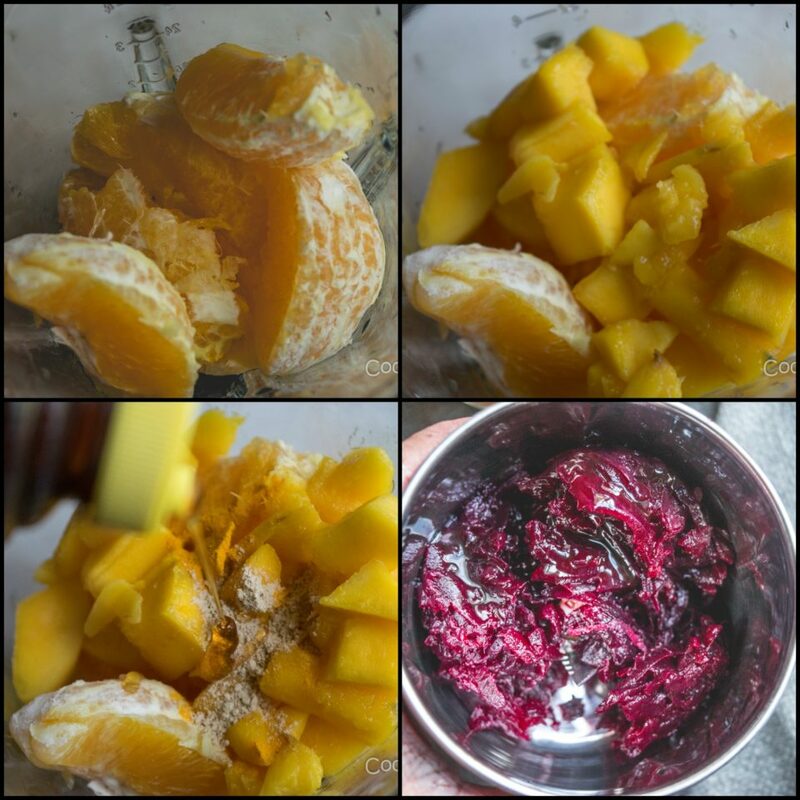 Enjoy this delicious freshly prepared mango orange summer drink prepared with beets today. It's a simple, dairy free, non alcoholic mocktail that's loved by all. Its sweet & tart! You need a good blender for this recipe and very few ingredients to make this drink. Add orange, mango slices, honey, ginger powder and lime juice together. Blitz. Strain this if you like a clear juice. Else leave it as is. Wash the blender and add cooked and grated beets along with honey and blitz again to a smooth puree. To serve, first add a couple of spoonfuls of freshly prepared beet juice in the serving glass and then pour the mango orange juice in it. Add ice cubes if required and serve chilled. You can also check out these juice recipes if you too are into juicing like I am – Spiked Plums & Strawberries Juice – The Ultimate Refresher Drink, Blueberry Mist, Honeydew & Orange Chiller Drink, Watermelon Margarita Slush, Mango Mastani, The Ultimate Detox Drink with Berries & Lime!, Indian Summer Drink – Tomato Jal Jeera, Lime Mix Drink for Summers!, Sparkling Cranberry Pomegranate Drink, Ice Cream Smoothie and Raspberry Apple Lassi Recipe.